The stance of the Diavel is that of readiness, dominance, and confidence bordering on superiority. 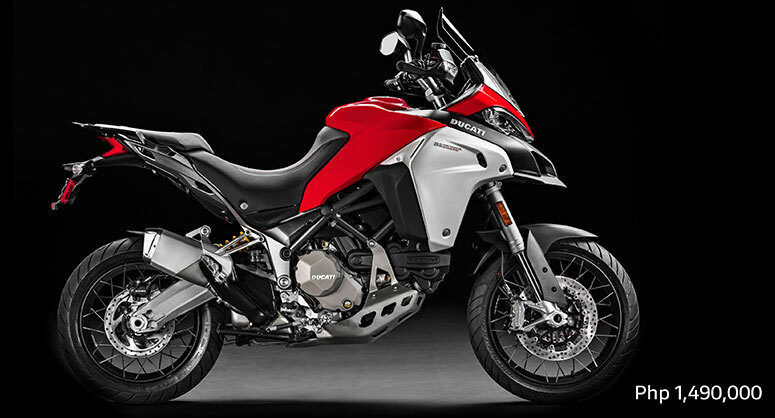 Lateral radiators add muscle to its broad “shoulders,” which then taper down across the engine and into the belly-fairing with its oil cooler, giving shape to the athlete. A massive 240 section rear tyre is the perfect example of how Diavel designers used a no-compromise attitude when applying their wish list of features. The sheer width of rubber communicates so much power and style that the R&D team vowed to find, and succeeded in finding, a way to make it handle – even if they knew the image would send a seismic shock through the industry. One of Ducati’s main goals is to offer every Ducatista the chance to enjoy unlimited and safe travel all over the world. To achieve this aim, Ducati offers a “fast delivery” original spares service, with delivery in 24/48 hours across 85% of the areas in which it operates. With a distribution network that covers more than 90 countries, thanks to 783 official Dealers and Service Points, choosing a Ducati means you can travel worry-free and in total freedom, wherever the road may take you, and count on capillary support that ensures Ducati quality and professionalism is always close at hand. In designing each bike, Ducati constantly strives to ensure maximum reliability while reducing service costs. A commitment that has seen the intervals for the main Desmo Service, in which valve clearance is checked and adjusted if necessary, to be extended to 30,000 km, 24,000 km or 12,000 km (18,000 mi, 15,000 mi or 7,000 mi respectively) depending on the model. Even the simplest of checks, such as the Oil Service, are extended to 15,000 km (9,000 mi)/12 months or 12,000 km (7,000 mi)/12 months. Ducati continuously invests in the technical training of its dealers. The specific skills offered by the official Ducati Service network ensure that all those operations needed to keep every Ducati in perfect condition are thoroughly executed, while advanced equipment such as the Ducati Diagnosis System allows the software on each Ducati to be updated with the latest releases, ensuring that the electronics continue to perform at the maximum level. The constant work done by Ducati in terms of design, research and development has the specific objective of ensuring cutting-edge motorcycles characterised by the highest levels of active safety. A commitment that translates into the definition of increasingly advanced systems that increase the level of the rider’s control, as in the case of the Ducati Safety Pack (DSP), the package for the Diavel consisting in Bosch ABS and Ducati Traction Control (DTC), both adjustable. An outfitting that optimises the dynamic behaviour of the motorcycle both during braking and acceleration.